Custody of Sky is awarded to the Jensons as Joe looks on, distraught. Jim and Helen are discussing Todd and Cody's disappearance. 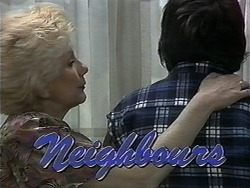 Jim is reassured now that Doug has gone after them, and they know which direction they have gone in but Helen reminds him that it is a big country. Jim expresses his guilt about Todd running away instead of facing up to his responsibilities like a man while Helen exclaims that he isn't a man yet. Madge and Sky are painting, when Joe and Harold return from the hearing. Harold dejectedly shakes his head, as a choked up Joe gives Sky a hug. 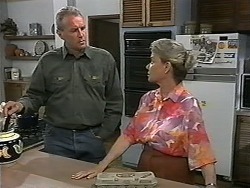 Madge is outraged, pointing out that Eric Jenson didn't show any interest in Sky until Joe's adoption application, and is even more outraged when she discovers that Joe has to hand Sky over in the morning. MADGE: Kerry wouldn't have wanted this. She knew Joe loved Sky. It would break her heart if she knew this had happened. Melissa is expressing her dislike for school dances, which confuses Josh as she bought a new dress for it last week. Confirming that she does not want to go, Melissa says that it is alright if Josh wants to take someone else to the dance but Josh wants to take her. 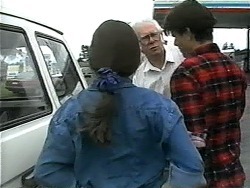 Pam excitedly explains to Helen that Doug has caught up with Todd and Cody at a service station where they bought food before but that they are hitching. Todd and Cody are dropped off, as the driver couldn't take them any further. Todd comments that Cody might not be feeling too good, but she thinks they should just have a seat and make a ‘phone call to let everyone know they are alright. Another driver offers them a lift, so they throw their bags in the back and go to make the call when he drives off with their bags in the car. Having spoken to some of the lighting guys, Josh has figured out why Melissa doesn't want to go to the dance - the strobe lighting could affect her epilepsy. He offers to have the strobe lights pulled, but Melissa is insistent that she does not want any favours as when people make a fuss it makes her feel like a freak. Josh insists that if she doesn't go then neither does he. Harold, Toby and Sky are playing with a toy unicorn as Madge urges Joe to explain what is happening to Sky. He doesn't know where to start and is worried that if they don't do the right thing by her then she'll think he and Toby just walked away and abandoned her. Madge claims this is all the more reason to tell her. Josh hasn't heard anything from Todd but he assures Jim that he will tell him anything as soon as he hears it. Josh has to go and fix up the music so the other guys can keep it going, as he won't be attending because he is taking Melissa's mind off the dance. 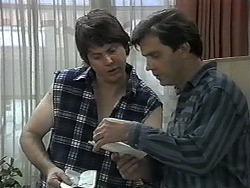 As a reward for the information about Todd, Jim gives him fifty dollars. The phone rings in the background and Helen answers it - it's Todd! He won't tell her where they are but ensures her that he and Cody are alright. Madge and Harold are packing away Sky's things. Harold tears up when recounting the number of times he told Sky her favourite story, while Joe picks up a toy dog which was for the baby. Madge pops upstairs to slip it into bed beside her, so that it would be there when she wakes up. 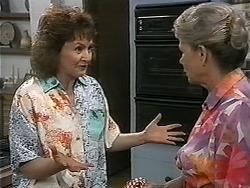 Pam and Helen are frustrated that they still don't know where Todd and Cody are. When Doug rang it was raining heavily, so they hope that they have at least got a roof over their heads. Todd and Cody have found a barn to sleep in for the night, both are soaking wet. Cody looks even worse than earlier, has a temperature and is shivering all over. Todd thinks they should find a doctor but Cody doesn't think they could find one now, so they should make the most of their situation by pulling the hay over themselves and cuddling closely to keep warm. Melissa thinks it is fine if Josh is taking someone else to the dance, but he reassures her he isn't going. He has a special surprise for her and she has to wear the dress she bought for the dance. Cody is coughing and looks awful. Todd decides that it is time to get her to a doctor. Joe is giving Eric the last of Sky's stuff. Joe has made a few lists about what she eats, her immunisation dates, bedtimes, favourite toys and what she likes doing. Sky says goodbye to Toby, Madge and Harold. HAROLD: I'm going to miss you too. Joe is overcome with emotion and starts crying as they wave goodbye out of the window.